Knit For Life is a registered Australian charity founded by Mally Ellis who grew up in rural Zimbabwe. It is run by a team of volunteers based in Sydney, Australia with Mally serving as its CEO. Profits from sales and all donations are directed back into the Knit For Life Community. Empowering the community to help themselves is Knit For Life’s guiding purpose. Twin sisters, Mally and Jackie Ellis started Knit for Life, then known as Grasshoppers, in 2000 after immigrating to Australia and recognising a gap in the market for heirloom quality, handmade cotton knitwear, cotton being an ideal knitting fibre to use for the Australian climate. The sisters set out to supply a range of baby and children’s knitwear, whilst supporting the impoverished Zimbabwean community near where they grew up. 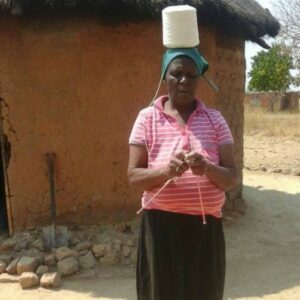 Growing up, we had always admired the skills of the artisan knitters from the rural areas close to where we were born in Zimbabwe. My mother was living in Harare at the time and would open her house to a group of knitters who travelled the three hours by bus to Harare from the Chatsworth area near Masvingo to spend the day knitting under her guidance. Under her guidance, our first group of knitters were trained to meet Australian standards. Some of the women had HIV, and this was their therapy during their illness. Soon after Stella Nyathi took on the job of managing local operations and is still with us today. In 2016, Grasshoppers evolved to become Knit for Life, and in 2017 became a registered charity with the ACNC, (Australian Charities and Not-for-profit Commission). In 2018 Knit for Life was accepted by the ACNC as having Deductible Gift Recipient status, to accept tax deductible gift donations. Read about the how Knit for Life empowers women to gain basic business and entrepreneurial skills which generates an income to support their families, educate their children and break the cycle of poverty. Zimbabwe currently has a 95% unemployment rate and remains one of the poorest countries in Africa. Many in the Knit for Life community have HIV, some of the knitters have a disability, making it harder for them to find employment and many of the knitters have taken on caring for their elderly parents, their grandchildren, nieces and nephews and other children in the community.